​Is it possible that your spouse's primary Love Language is Quality Time? Listen to this edition of A Love Language Minute with Dr. Gary Chapman to hear more. ​Improving workplace relationships begins with helping workers feel appreciated. Hear more on this edition of A Love Language Minute with Dr. Gary Chapman. ​In a separation, there can be no genuine reconciliation unless one is willing to confess and turn from past failures. Hear more from Dr. Gary Chapman on this edition of A Love Language Minute. ​On this edition of A Love Language Minute, Dr. Gary Chapman responds to a listener who is being confronted with a partner's issues from the past. How do they move forward? Listen to hear more. ​What to do when the Love Language of Words of Affirmation is the primary language of your partner, but not yours? Hear Dr. Gary Chapman respond to this listener's question on this edition of A Love Language Minute. ​The beginning of reconciliation begins with confessing your own failures. Hear more from Dr. Gary Chapman on this edition of A Love Language Minute. Dr. Gary Chapman says that when people feel appreciated they are more engaged and they give themselves to their work. What business owner wouldn't want that? Hear more on today's A Love Language Minute. ​Dr. Gary Chapman says that, when a couple is separated, it is easy to ID failures of our mates, but more difficult to admit our own. Hear more on today's A Love Language Minute. What If The Relationship Seems Over? ​On this edition of A Love Language Minute, Dr. Gary Chapman responds to a listener's question, wondering if there's still hope for a relationship if it seems like it's over. Listen to hear more. Going Through A Divorce Am I Crazy For Wanting Her Back? ​On this edition of A Love Language Minute, Dr. Gary Chapman addresses a man who is in the process of divorce, but still loves his wife in spite of messy circumstances. Is he crazy for wanting her back? Listen to hear more. ​Fixing blame can sometimes keep us from taking the first steps toward reconciliation. Hear Dr. Gary Chapman discuss this topic today on A Love Language Minute. ​Are you doing a good job of expressing appreciation to those you work with? Today, Dr. Gary Chapman challenges you to examine what makes others in your workplace feel loved to help create a more positive work environment. Hear more on this edition of A Love Language Minute. Is It Possible To Have Relationships While Living Apart? ​While separated, it only takes one person to break the silence. On this edition of A Love Language Minute, Dr. Gary Chapman discusses breaking the standoff. ​Today, a listener expresses her frustration with her husband over a lack of affection. 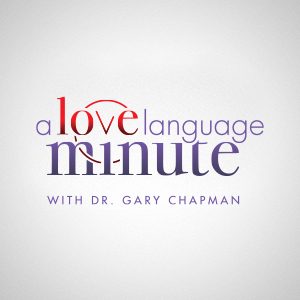 Hear Dr. Gary Chapman's comments on this edition of A Love Language Minute. ​On this edition of A Love Language Minute, Dr. Gary Chapman responds to a listener who wants to know what the tell-tale signs are if a spouse is having an affair. ​Today, Dr. Gary Chapman challenges you to take the first step in discovering the Love Languages of your co-workers to create a positive emotional climate at work. Hear more on this edition of A Love Language Minute. ​Today, Dr. Gary Chapman confronts the myth that says you only have two options in your bad marriage: be miserable for life, or get out. Hear more on this edition of A Love Language Minute. ​Today, a listener, who was abused in the past, wants to know how to disentangle traumatic deficits from the Love Languages. Hear Dr. Gary Chapman's response on this edition of A Love Language Minute.